Leicester defender Harry Maguire says "confidence is flowing" as manager Claude Puel experienced a comfortable victory on his return to former club Southampton. Puel was sacked by the Saints in June after just one season in charge, having guided the club to eighth place and the League Cup final. The Frenchman, who took over at Leicester in October, celebrated on the touchline without going over the top as the Foxes claimed their fourth consecutive win in style thanks to two goals from Shinji Okazaki. "When Claude came in we were struggling to score goals but now we are finding the net," Maguire said. "We create chances and score goals." Leicester took an early lead at St Mary's with a fine individual goal from Algeria winger Riyad Mahrez, who cut in from the left before striking a low, powerful shot into the corner of the net. Puel's side were three goals ahead by half-time when Maguire crossed for midfielder Andy King to tap in at the back post. Southampton, much improved after the break, pulled a goal back after an hour through defender Maya Yoshida, who climbed highest in the six-yard box to head in Ryan Bertrand's corner kick. But the visitors blunted any hopes of a Saints comeback when Jamie Vardy's cross picked out strike partner Okazaki's brilliant run and he finished emphatically. Puel's single season at Southampton, on the face of it, looked impressive, finishing eighth in the Premier League and taking his side to the League Cup final at Wembley, which they were unfortunate to lose to Manchester United. And yet nobody was shocked when the 56-year-old was sacked at the conclusion of a campaign in which he failed to capture the imagination of the home support and suffered from accusations that the football his Southampton side produced was dull. The statistics were hardly compelling, with Puel's Southampton scoring only three goals in his last seven Premier League matches at St Mary's - so what a contrast on his return as Leicester matched that tally inside 38 minutes. Puel's Leicester are vibrant, lethal on the break and were committed to attack from the kick-off - a hallmark of his short time in charge. And how Leicester's fans loved it, chanting "Are you glad you sacked Puel?" at their frustrated Southampton counterparts as his successor Mauricio Pellegrino felt the fury of the home fans. Puel celebrated Leicester's goals with real delight without being excessive - but he must have been left with a real sense of pleasure after another satisfying night. In the early stages of the season, Mahrez was a shadow of the brilliant attacker who helped to inspire their title victory in 2015-16 and won the recognition of his peers when he was named PFA Player Of The Year. Mahrez was at the centre of transfer speculation right up until the window closed at the end of August - but the arrival of Puel has coincided with a return of the Algerian's finest form. He has struck spectacularly at home to Tottenham and away at Newcastle recently and was on target to break the early deadlock in Southampton with a trademark low left-foot finish after a run that created his own space. Mahrez also helped set up Okazaki for Leicester's fourth and produced a performance to warm Leicester's travelling support on a bitterly cold and wet night. The transfer speculation may spark up again when the window opens in January - but for now Leicester and Puel will simply be delighted to have a mercurial talent back on peak form. Southampton's night went rapidly downhill after the first couple of minutes in which they managed to cause Leicester's defence minor anxiety. Once Leicester settled down and got the measure of Southampton, their pace, width and speed on the counter-attack reduced the home defence to a disorganised shambles, including centre-back Virgil van Dijk. As Southampton's performance deteriorated, so the discontent of the home fans became more obvious, especially with a deafening chorus of jeers at half-time. 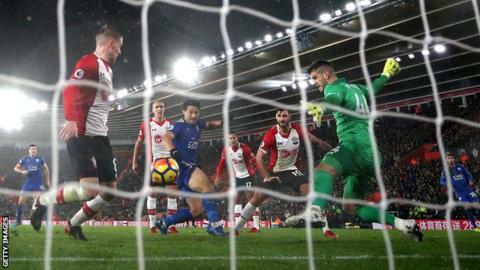 Yoshida's goal offered the briefest of hope for Southampton and they almost grabbed a second when Leicester goalkeeper Kasper Schmeichel blocked Charlie Austin's shot miraculously at the far post. In reality, they were outclassed from start to finish and Leicester only emphasised the gulf between the sides by increasing the tempo to quickly restore their three-goal advantage through Okazaki. Pellegrino stood disconsolately in his technical area as he looked out at a near-deserted St Mary's at the final whistle with only four league wins this season. This was a night that belonged to a Saints manager past, rather than a Saints manager present. Leicester manager Claude Puel: "The result is the result. It is a good feeling to come back here. It was nice to see familiar faces. I have a lot of friends. I appreciated the staff and players. "My team is the most important thing. I am proud of my players because we gave a fantastic game. It was important to maintain the performance and it was a good result at half-time but we came back again. "If we have the ability to maintain the good results with changes it will be good for the future. It is still the first part of the season and the Premier League is difficult every week. All is not perfect, we still need to correct things and make progress." Southampton manager Mauricio Pellegrino: "It was a really bad game from the beginning to the end. After conceding the first goal they were getting better and little by little our confidence went down. We gave the ball away all the time. "For me it is a bit about concentration, not being 100% focused and at this level you cannot be giving this advantage. It was an awful day and that is the reality. "In the Premier League there are a group of teams where the gap is four or five points and we have to fight. Obviously we have the same feelings as the supporters. Three days before we played a good game but in football in three days everything changes. We need to react now." Since Claude Puel took charge of Leicester only Manchester City (21) and Burnley (18) have won more points in the Premier League than the Foxes (17). Leicester City scored four goals in an away Premier League game for the first time since drawing 4-4 with Spurs in February 2004. Southampton conceded three first-half goals in a home Premier League game for the first time since April 2005 against Norwich City. Five of Riyad Mahrez's last eight Premier League goals have been from outside the box - his previous 21 were all scored from inside the box. Shinji Okazaki scored and assisted in a Premier League game for the first time. This match was the first in Premier League history to see two different Asian goalscorers - Okazaki for Leicester and Maya Yoshida for Southampton. Leicester host Crystal Palace in Saturday's early kick-off (12:30 GMT) while later that afternoon at 15:00 GMT Southampton face Premier League champions Chelsea at Stamford Bridge. Match ends, Southampton 1, Leicester City 4. Second Half ends, Southampton 1, Leicester City 4. Attempt missed. Charlie Austin (Southampton) header from outside the box misses to the left. Assisted by Cédric Soares. Attempt missed. James Ward-Prowse (Southampton) left footed shot from outside the box is close, but misses to the left. Substitution, Leicester City. Leonardo Ulloa replaces Ben Chilwell. Corner, Southampton. Conceded by Wes Morgan. Substitution, Leicester City. Demarai Gray replaces Jamie Vardy. Goal! Southampton 1, Leicester City 4. Shinji Okazaki (Leicester City) right footed shot from the centre of the box to the centre of the goal. Assisted by Jamie Vardy with a cross. Attempt saved. Charlie Austin (Southampton) right footed shot from very close range is saved in the centre of the goal. Substitution, Southampton. Nathan Redmond replaces Sofiane Boufal. Delay in match Kasper Schmeichel (Leicester City) because of an injury. Goal! Southampton 1, Leicester City 3. Maya Yoshida (Southampton) header from the centre of the box to the bottom right corner. Assisted by Ryan Bertrand with a cross following a corner. Corner, Southampton. Conceded by Kasper Schmeichel. Corner, Southampton. Conceded by Danny Simpson. Corner, Leicester City. Conceded by Fraser Forster. Attempt saved. Harry Maguire (Leicester City) right footed shot from the right side of the box is saved in the bottom right corner.